Published: June 22, 2017 at 01:34 p.m. Updated: June 22, 2017 at 07:21 p.m.
Save your tired debate show segment: Of course Derek Carr is worth the money. In the wake of Carr signing a five-year, $125 million extension with the Oakland Raiders on Thursday, there will be breakdowns of how Carr's money stacks up against other quarterbacks' guarantees and average annual salaries. There will be consternation in towns like Green Bay and Atlanta, stemming from awareness that Aaron Rodgers and Matt Ryan deserve more. It will be a waste of time. Franchise quarterbacks all take their turn near the top of the market, because the best NFL quarterbacks, like Carr, are uniformly underpaid. The Raiders had no choice but to get this contract out of the way. They couldn't afford any extra awkwardness with the team's best player heading into one of the most awkward seasons in NFL history. Oakland fans have waited for a campaign with this much promise for 15 years. They've waited for a homegrown quarterback to call their own since Kenny Stabler left town 11 years before Carr was born. Now Raiders fans have both, along with the uncomfortable knowledge that they won't have a team for long. The time is now for this Raiders squad, with Carr's value incalculable. Following the MVP candidate's devastating broken leg on Christmas Eve last season, the Raiders went from one of the NFL's best offenses to inert in subsequent losses to the Broncos and Texans. As steady off the field as he is accurate on it, Carr stands out for his composure and late-game dramatics. His 11 fourth-quarter comebacks over the last two years tied Peyton Manning (in 2008-09) for the most in a two-year stretch in NFL history. Manning won the MVP award both of those years. 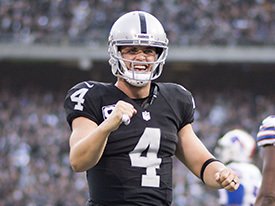 Raiders general manager Reggie McKenzie enjoyed the spoils of Carr's rookie contract, which paid the second-round pick a bit more than $4.3 million over the past three seasons, according to Spotrac.com. The team has spent copious amounts of cap space in free agency, compiling the NFL's most expensive (and effective) pass protection in the process. Yet ponying up for Carr was hardly a difficult decision. It's the price of doing business, and the price is more than fair. Carr is the 14th quarterback who will make more than $20 million per year in a market that is missing a middle class. NFL decision makers have happily paid that much because the price for quarterbacks remains low compared to other positions, and what QBs could receive on the open market. Dolphins defensive tackle Ndamukong Suh signed for $60 million guaranteed and $19 million per year in 2015's free agency, before the latest rises in the salary cap. Giants defensive end Olivier Vernon signed for $17 million per year as a free agent in 2016. Those prices indicate that even the highest-paid quarterback like Carr is only worth 24-31 percent more than a quality defensive lineman. Watching football every Sunday, not to mention watching the prices quarterbacks attract in trades, tells a different story. The Packers signed pass rusher Nick Perry on a contract for roughly half of Carr's deal. I love Perry as a player, but all 32 NFL teams would rather have one Derek Carr than two Nick Perrys. Teams would likely rather have one Derek Carr than four Nick Perrys, even without contemplating the moral and logistical issues. There's no telling what a great, young franchise quarterback would receive on the open market, because it never happens. General managers like McKenzie don't allow it to happen, because they know that other teams would happily blow the top off quarterback pay scales. Contemplate how much the Browns or Jets would pay Carr in a scenario where they didn't even have to give up trade compensation. $30 million per year? $40 million? "All of it," he replied. The last top-shelf quarterback to hit free agency was Peyton Manning in 2012, and that was coming off a career-threatening neck surgery. The Broncos still paid him at the top of the market, and they would admit now he was worth much more. With Derek Carr's mega-deal, he now tops the list of the league's highest paid players. See who else makes the cut. The machinations surrounding Redskins quarterback Kirk Cousins the last two seasons prove instructive. Cousins doesn't have the physical gifts or the long-term upside of Carr. The previous Redskins front office reportedly had mixed feelings about giving him a long-term deal. Yet the Redskins have been forced to pay Cousins close to $24 million this season on a franchise tag because losing a solid starting quarterback for nothing is unthinkable. Cousins has so much leverage that a new Redskins official compliments him publicly every day. The 'Skins are forced to campaign for Cousins just to take their money because the QB knows greater riches are around the corner if he becomes available next offseason. On the face of it, Cousins making more money than Aaron Rodgers, Drew Brees and Andrew Luck doesn't add up. Cousins' price tag only makes sense when you consider all these quarterbacks earn less than they are worth to a franchise. The computing above is done in a system where the salary cap ties down prices significantly. The cap has ultimately played a huge part in helping the NFL to grow, the most American of sports buoyed by socialist economic principles of sharing profits and capped wages. Just imagine, for a minute, a world in which there is no franchise tag and no salary cap. Imagine Derek Carr playing out his rookie contract and vying for the best deal possible from competing billion-dollar businesses. How much would a great, young franchise quarterback be worth then? $50 million per year? NFL owners are glad they don't have to find out. Two months removed from the Raiders' desultory playoff loss in Houston, coach Jack Del Rio was asked what he learned from the 2016 season. "Don't lose your quarterback," Del Rio deadpanned. Carr and other true franchise quarterbacks carry an incredible weight on their shoulders. He's worth the money because of his innate feel for the position, his decision making, his ability to mix speeds like a relief pitcher and his athleticism and arm strength to improvise when things go wrong. Quarterbacks are also asked to be franchise faces, with Carr a great example of a young man representing his organization with intelligence and character. That combination of value -- on and off the field -- is why Matthew Stafford will get his money soon, too, and the tired "Is he worth it?" conversations will start all over again. NFL owners and general managers know the answer. For the value they provide, franchise quarterbacks are still underpaid.